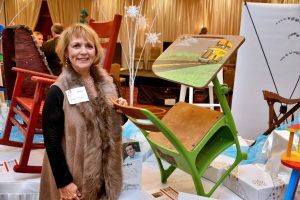 Union City, Ga (December 7, 2016) – Local artists, sponsors, hosts, community leaders, and volunteers, came together on December 1st for the tenth Annual Chair-ity Event benefitting The Children’s Village at Christian City. This special event is named for the unique chairs – artistically painted and donated by community artists – that are included in the event’s silent auction. A record-setting total of $200,000 was raised to support the ongoing needs of the abandoned, abused, and neglected children who now live safely at The Children’s Village at Christian City. George Franco, Fox 5 Atlanta news reporter, served as emcee and auctioneer at the event. 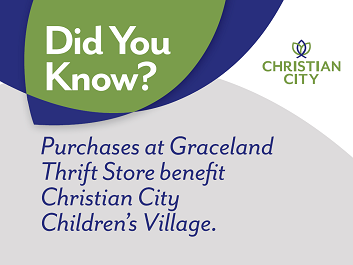 Jazz vocalist, Toni Byrd, and the Rick Massengale Jazz Trio provided musical entertainment as guests shopped the silent auction. Chairman of the Board of Trustees, Lawton Roberts, welcomed the attendees, and a prayer was offered by a high school student and current resident of The Children’s Village. Refreshments were supplemented this year by special gifts of homemade desserts provided by Christian City’s best bakers, senior residents who volunteered to support the Chair-ity event and The Children’s Village by baking their favorite desserts to be served to event guests. 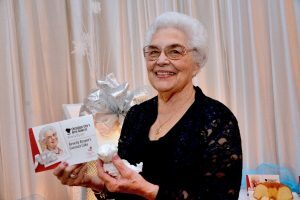 At the end of the evening, guests received a set of recipe cards for the desserts as a keepsake of the tenth annual Chair-ity event. For the first time this year, a live auction was added to the Chair-ity event. Packages ranged from a Big Green Egg and Beretta shotgun to a weekend stay at a north Georgia cabin, a 7-night resort vacation, and an acoustic guitar signed by Zac Brown. After hearing from Len Romano, President & CEO, and Program Director, Sarah Booth, who lived at The Children’s Village from age 12 through high school graduation, many of the guests extended their financial support even further by making outright donations following the live auction. Sarah is a graduate of Emory University’s Goizueta Business School, and she recently completed her Master’s degree in Professional Counseling. 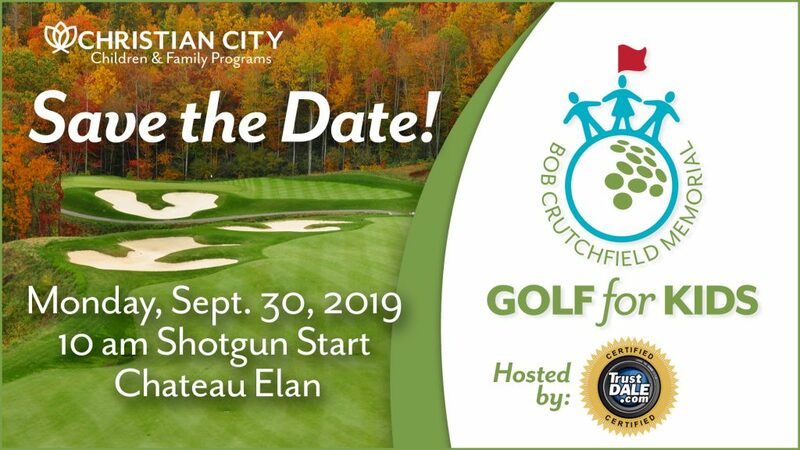 The Chair-ity event took place at the Crowne Plaza in Peachtree City and featured a raffle drawing for a new Q50 car provided by Infiniti of South Atlanta. The raffle was hosted by south side Rotary Clubs and the drawing was conducted at the conclusion of the event. The $10,000 cash option prize was presented to the raffle winner, Cynthia Bennett of Newnan. Upon receiving the check, she immediately returned a $5,000 donation to The Children’s Village at Christian City. The parents of two adopted daughters, the Bennett family has always been supportive of efforts to improve the lives of children. “One of my daughters and my mother lived in group homes as children,” Cynthia said. “Organizations like The Children’s Village at Christian City are dear to my heart, and I am happy to support their work,” she said. Since 1965, The Children’s Village at Christian City, has provided a safe haven for children who have been abandoned, abused or are otherwise homeless. Children ages 5-18 live in cottages with full-time house parents, where concentrated efforts are put forth to heal their wounded spirits and break the cycle of abuse they have endured. A warm home, healthy meals, clean clothing, quality education, necessary counseling, and a lot of loving care are provided to the children who come to the campus. Some children stay for a short time, while others spend their entire childhoods at The Children’s Village at Christian City. The campus is also a licensed National Safe Place agency dedicated to helping runaway and homeless youth. Christian City is a non-denominational, non-profit organization established 51 years ago when the first cottage for abused and abandoned children opened on Valentine’s Day in 1965. Today, there are more than 1,000 residents living on the Christian City campus, which has grown to more than 500 acres. The campus, located on the southwest side of Atlanta between Fairburn and Fayetteville, includes The Children’s Village, four subdivisions of affordable patio homes for senior adults, four affordable apartment complexes for seniors on limited incomes, a thrift store, a 200-bed rehabilitation and nursing center, a 200-bed assisted living/personal care home, and two specialty units for victims of Alzheimer’s disease and dementia. Christian City is located in Union City, just south of Hartsfield-Jackson Atlanta International Airport. For more information, to donate or volunteer, visit www.christiancity.org or call 770-964-3301. Photo above: Beverly Bryant joined 20 other Christian City senior residents in volunteering to bake special desserts to be served at the 10th annual Chair-ity event. Photo above: Vicki Turner, Fayetteville resident, artist and Chair-ity committee member, displays the vintage school desk she painted for the 10th annual Chair-ity silent auction. 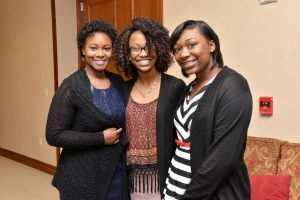 Photo above: Residents of The Children’s Village at Christian City, (from left) Aleiyah, Sierra and Jalyn, greeted guests as they arrived at the 10th annual Chair-ity event. Aleiyah also provided the opening prayer. 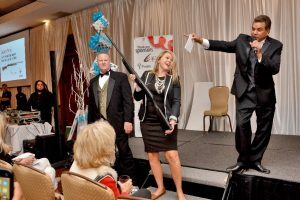 Photo above: Ashley Bonner, Christian City’s Director of Fund Development and Senoia resident, assists George Franco (on stage) with the live auction at the Chair-ity event. A Beretta shotgun was one of the live auction items up for bids. 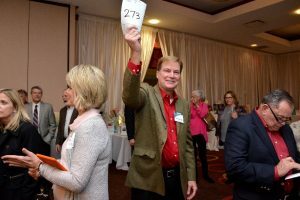 Photo above: Ed Richardson, Christian City Board of Trustees member and Peachtree City resident, signals a bid during the Chair-ity event live auction. Photo above: Retired educator and Newnan resident, Cynthia Bennett (center), won the Rotary Raffle at the 10th annual Chair-ity event on December 1st. 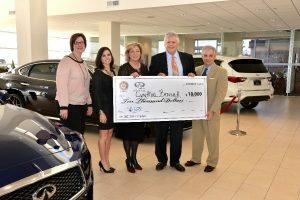 Pictured at the check presentation are (from left) LaVann Landrum, Christian City’s Chief Development Officer; Rachel Bennett, daughter of Cynthia Bennett; Cynthia Bennett; David Watts, Infiniti of South Atlanta GM; and Len Romano, Christian City’s President & CEO.